ShredLights is one of the coolest ideas we’ve seen brought to life by an electronics startup. We interviewed founder Drew Page to find out more about where his idea came from and get his perspective on what it takes to successfully manufacture and launch a new lifestyle device. Tell Us About ShredLights. How Did you Come Up with The Idea? Drew Page: I used to be a sponsored skateboarder. I like to say that, over my skateboarding career, I’ve probably hit over a billion cracks in the sidewalk, so I’ve fallen many, many times. Well, one night I was skateboarding home from the local liquor store and hit a massive crack in the sidewalk. To this day I still believe it was the San Andreas fault line! I slammed into the street and all my stuff exploded on impact. Then, as I was limping home, a car came from behind me and illuminated my path and suddenly I could see the rocks, cracks and every detail on the street. And right then and there, a lightbulb went off in my head, and I got the idea to put headlights on skateboards. How Does It Work? How Do You Get The Lights on the Skateboard? So you put a bracket on the existing hardware between the truck the baseplate and the nut that holds it on. So it sits between the deck and the wheels in the wheel well area. It doesn’t protrude out and it’s protected by the truck. 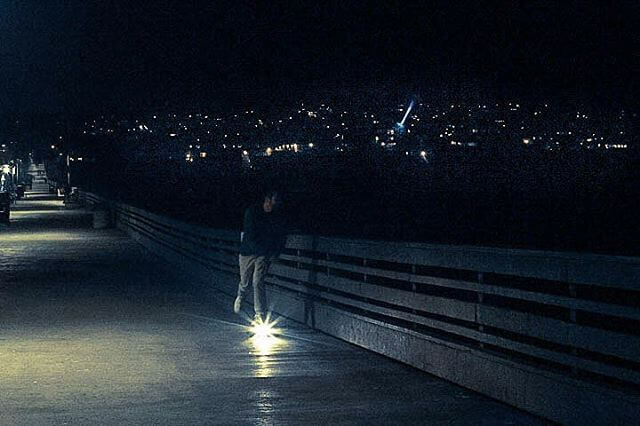 So if you do performance skateboarding, you can do everything you normally would with ShredLights on your board — you can noseslide, boardslide, 50-50, everything. And we’re always working on better ways to mount the lights to the board. There’s 6.5 million skateboarders in the US alone, and skateboarding is a global phenomenon right now. That’s both the core — people who skate 4 or more times a week in the street or at the skate park — and the casual skateboarder who skates for transportation, like to get to class or the store or on their long board. There’s 6.5 million skateboarders in the US alone, and skateboarding is a global phenomenon right now. So originally, with my background as a sponsored skateboarder, we thought we could target the core market. But then we also realized that core skateboarders are anti-change, they don’t want anything to disrupt their current lifestyle. On the other hand, casual skateboarders are very open to innovation and are willing to try new things. But we’re still trying to target both markets. We gave Greg Lutzka a pair, he’s a pro skateboarder for Rockstar Energy and Darkstar. He likes ShredLights a lot, but he uses it for his cruiser board, not his performance skateboard. Our goal is to get ShredLights in front of influencers in this core market, and then trickle down to the casual skateboarders. Eric Birkemeier is the co-founder, Kyle Kitzmiller is the mechanical engineer, ShredLights’ CTO. Nicolette Shasky is our Graphic Designer, and Anthony Dito is the programmer. How Did You Get Into HW Engineering? I studied business, but I fell into the right crowd working with some people with masters degrees in mechanical engineering. I met Kyle and Eric at the Zahn Innovation Center at SDSU. Kyle works there as Lead Mechanical Engineer at the HG Fenton Idea Lab. So yeah, I don’t actually have a lot of engineering background myself, but I’ve learned a lot working with these guys. Luckily, they were as intrigued with the idea of ShredLights as I was. Being from San Diego, we all grew up in the surf/skate lifestyle. Do You Have A Hardware Engineering Background? I’ve done some Arduino projects, mostly to get familiar with the computer programming side, because I’m really interested in learning that. I’ve done some tinkering. For example, I made a device that opens my blinds from my bed. So just some tinkering; and working on ShredLights, I’ve learned a lot more than I thought I ever would. I keep expanding my horizons and I’ll definitely gain experience going into more hardware projects down the road. What Is Some Advice You Can Share About The Manufacturing Process? I like the advice that, whatever amount of time you estimate, and however much you think your product is going to cost: double it. I’ve learned now to think ahead a little more. You know, it seems like simple supply chain management — you place your order and you get your part. But every vendor works at their own speed, so you have to consider that your project is not always going to be their utmost concern. So you have to work with that timeframe in mind. I like the advice that, whatever amount of time you estimate, and however much you think your product is going to cost: double it. Tell Us About Your Prototype – Did You Guys Use Any Dev Boards in Your Design? Arduino would have been too big for our product, but for our prototype we did use existing Chinese keychain lights and then we did the mechanical engineering to design the enclosure around those. We attached the lights to a bracket system, you can take them on and off the skateboard. So we didn’t do any of the electrical engineering for the prototype. But, we quickly found out that Chinese keychain flashlights are not durable enough for the vibration on the skateboard. The lights quickly flickered and died. So we learned pretty quickly that we needed a durable product. So after we went to our EE contractor and he designed the board, we realized we needed to further protect the PCB, because skateboards are constantly vibrating. And if you’re doing performance skateboarding, then your board is getting flown around. So we actually started conformal coating the board and we’re testing that now. What’s Your Biggest Challenge From A Technical Standpoint? The vibration issue and all the moving parts. One of the biggest concepts for us is that, when you’re skating during the day, you don’t need ShredLights, obviously. So you don’t want them on the board. By being able to take them off, you can cut the vibration the lights are experiencing. So we made a system where you can take the lights on and off. But with the original system we devised, we started to notice that there’s a lot of vibration and rattling and it made an annoying sound. So we started using a 3D printed material called Ninja Flex. It prints out a very soft and bendable material, and this removed the rattling noise, which was a big issue we resolved. What Are Some Lessons From Crowdfunding and Kickstarter? Well, we’ve been working on ShredLights for two years. We started out by raising $15k from friends and family. And later, unfortunately, we had an unsuccessful Kickstarter campaign. So one lesson — definitely start to raise awareness really early on. We waited until a week or two before the launch to start pumping out the articles, and it was just too last minute. We didn’t have enough content, and it wasn’t the right content at the right time. One big lesson on crowdfunding — definitely start to raise awareness really early on. Another thing that works really well, reach out to similar campaigns and see if they’re interested in your idea. If they are, see if they’re willing to share it with the communities that they’ve already built. Luckily, we reached out to the guys at ZBoard, an electronic skateboard startup; they’ve had some successful campaigns. The founders were willing to share our campaign with their network. That was really good for us. Even though we didn’t reach our goal, it got us some traction. So find people in your space that have done it before. They’ve been through it; they know how hard it is, and a lot of time they’re willing to help, which is great. One thing we’re working on is making the lights smaller in the next design. The lights are USB rechargeable and all our customers keep telling us that they haven’t even charged the lights yet. So we could probably take the battery down a bit and make the lights smaller, because smaller is obviously better. Also, we have a software developer on board right now who is building a mobile app. The vision is kinda based on something like a Nike Running app, so you’ll be able to track your routes. So for example, if you know a good hill bomb, you can start and end your route on your phone, so you can share that with other people who can go to that route and bomb the hill and see if they beat you. And the app will keep track of who you beat and who beats you. And the app will also let you document skate spots, so if you know a great spot you can log it with a picture, so the community will help you find other great spots to skate. For example, maybe you know a good spot where you can skate at night without getting hassled by the cops. And then we’re also thinking about doing a tail lights package too so you can have lights on front and back of your board. Because say, for example, if you switch-stance or pop-shove-it into a 180, you’re still going to want to be able to see what’s in front of you. A lot of our customers are already buying two pair at a time for this reason. And then later on we’re talking about adding a bluetooth radio so you can adjust the lights up and down from your phone, so if you suddenly find yourself going down a dark alley way, you want to see a bit more. Right now you gotta pick up your board and adjust the lights, but with bluetooth you could just pull out your phone and turn the lights up, which is much more convenient. Where can We Get A Pair to Try Them Out? Right now we’re working with Adrenalina which is a longboard specialty shop in La Jolla, California. You can also buy a pair on our website at ShredLights.com. They’re retailing for $39.99.